A good day to you fine Zombiology Student, come on in and make yourself comfortable. Rock climbing is a challenging but extremely fun activity. In the inevitable Zombie Apocalypse it may be reassuring to know you can simply ascend to safety and take up residence in a cave, holding weekend dinner parties with Bigfoot. But this reassurance may be shattered if the undead can simply shimmy up after you. Let’s first find out what it physically takes for us humans to climb. Studies have shown that the average elite male climber is around 5 foot 8 inches, and weighs about 65 kgs. Muscular endurance is important, as you often have to hold your hand in a single position whilst your body moves. What makes climbing rather physiologically unique is that it requires sustained and intermittent contraction of the forearm muscles for upward propulsion. A good climber will generally have a small frame, low body fat, a high level of upper body strength, a reasonable balance of strength between their arms, and a high endurance factor. Let’s compare that with the physicality of a human suffering from the Zombieism condition. The areas of the brain known as the cerebellum and basal ganglia are imperative for physical movement, and would likely be affected by Zombieism. Damage to the cerebellum would prevent a Zombie from tuning and refining their movements. This would make conducting the careful and deliberate motions for climbing very difficult. The basal ganglia helps us select the correct movement in a particular situation. Damage here would prevent the Zombie from actively choosing say, to move it’s hand over moving it’s leg. You can now imagine how this might affect one’s ability to climb. Furthermore the cerebellum helps us to keep the image our eye’s are seeing still when we turn our head. If it is damaged the image will appear to slip, making it difficult to keep focus on a particular spot such as an important hand hold required for climbing. 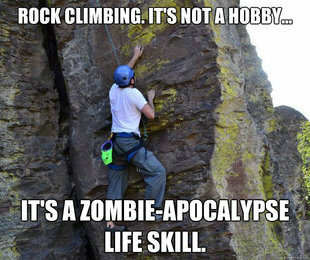 So the answer to Chris’ question, “can Zombies rock climb” , is thankfully, no. The disease robs them of the skills required to undertake such a task. When the outbreak begins, rock climbers can simply scale their way up to safety, kick back with Bigfoot and watch the world burn below. I’m always seeking questions to answer here on the ZomBlog. Why not leave yours as a comment below? Or visit our Book of Faces (www.facebook.com/zombiescience) and ask your question there. I’m here for all your undead knowledge needs. Many thanks to Chris for today’s question, and I’ll see you next time, unless you’re out at a rock climbing lesson! Interesting! While zombies may not be able to climb I bet they'd be pretty good at caving which only requires the ability to fall down a hole. it's also dark and wet down there and I think they'd like that.